Pictured above is Patrick Davis with rig BR 120 after a long day on the drilling site in Charlotte, North Carolina. 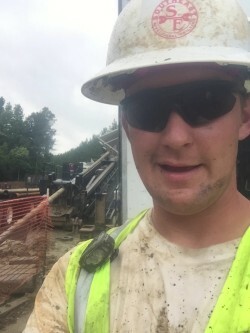 The crew has worked its way through sand and solid rock in Greenville, Greensboro, Charlotte and Leland under the supervision of Caylon Silvers. Silvers says that while the 12 to 14 hour days are long and the environment is 95 degrees with a wave of humidity, “it isn’t anything the guys can’t handle. They are all pretty tough.” With his only complaint being that there is a lack of good fishing spots in the area, Silvers and the crew are getting the job done right and working to the SEDD standard.